A cough is an action your body takes to get rid of substances that are irritating to your air passages, which carry the air you breathe in from the nose and mouth to the lungs. A cough occurs when special cells along the air passages get irritated and trigger a chain of events. The cough reflex is a vital part of the body's defense mechanisms. WOODS' Peppermint Cough Syrup contains the active ingredient of Guaiphenesin. Guaiphenesin is an expectorant which acts against thick, gooey mucus by thinning and breaking down the phlegm structure that clings to your air passage walls. Once loosened, it becomes easier and faster for your system to flush out phlegm. 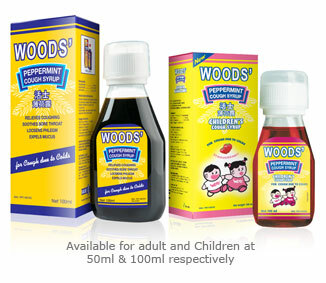 Trust WOODS' Cough Syrup's Active GTM to expel phlegm fast!